Since its inception in 1918, the Finnish Defence Forces (FDF) have fielded an array of mortar systems – including 60, 81, 120, and 300 mm calibre examples – with all of the munitions for these systems manufactured domestically. While the FDF has not adopted a 160 mm system, Finland nevertheless developed such a system, and later exported the design. 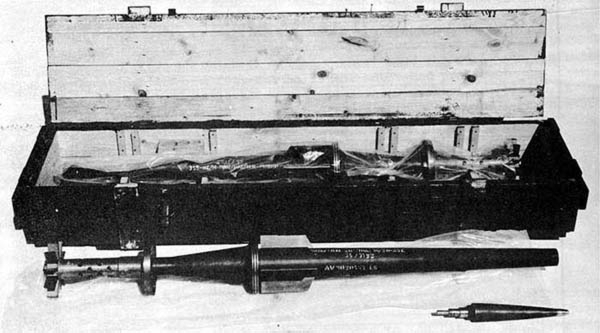 The resulting mortar was known as the 160 Krh/58C, and a unique extended-range projectile, known in some sources as the Model 1/53, was also developed. Finland’s primary producer of mortar systems was Oy Tampella Ab (called Tampereen Pellava- ja Rauta-Teollisuus Osake-Yhtiö’ until 1963; typically known simply as ‘Tampella’), based in the city of Tampere in southern Finland. 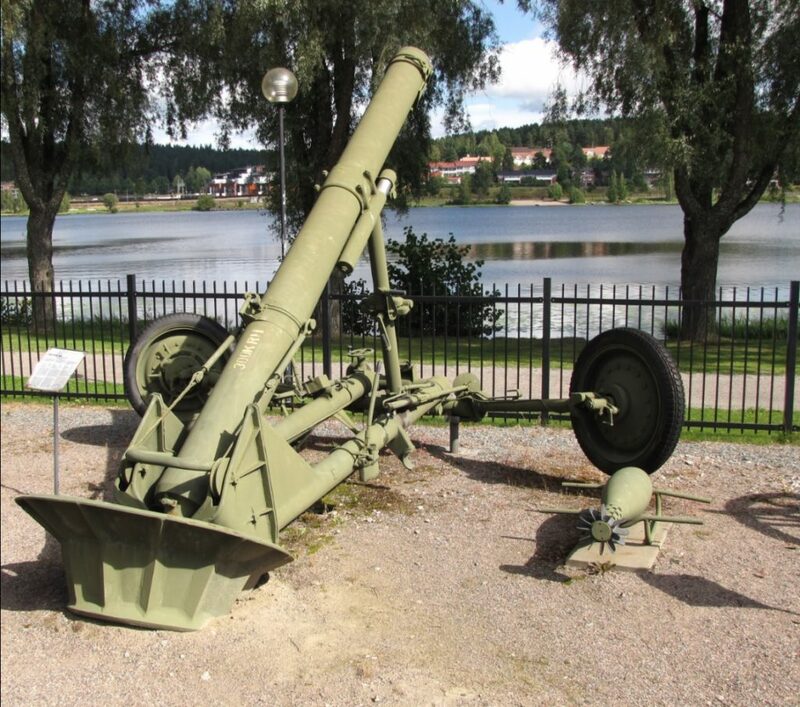 In 1954, Tampella proposed to the Finnish Ministry of Defense that the FDF expand its artillery arsenal to include a 160 mm mortar system; a system that could engage targets at a maximum range of at least 10 km was requested. Tampella had previously produced 120 mm mortar projectiles with a ballistically optimised shape, capable of ranges up to 8.5 km. The new 160 mm projectile design concept was for a spear-like projectile (sometimes known as an ‘arrow type’ projectile) with outstanding ballistic qualities that could be fired from a lightweight platform. This platform, the mortar itself, was based on a 300 mm mortar system known as the 300 Krh/42, designed by Hans Otto Donner at Tampella in 1942. By 1955, Tampella had designed and produced a prototype of the desired weapon. 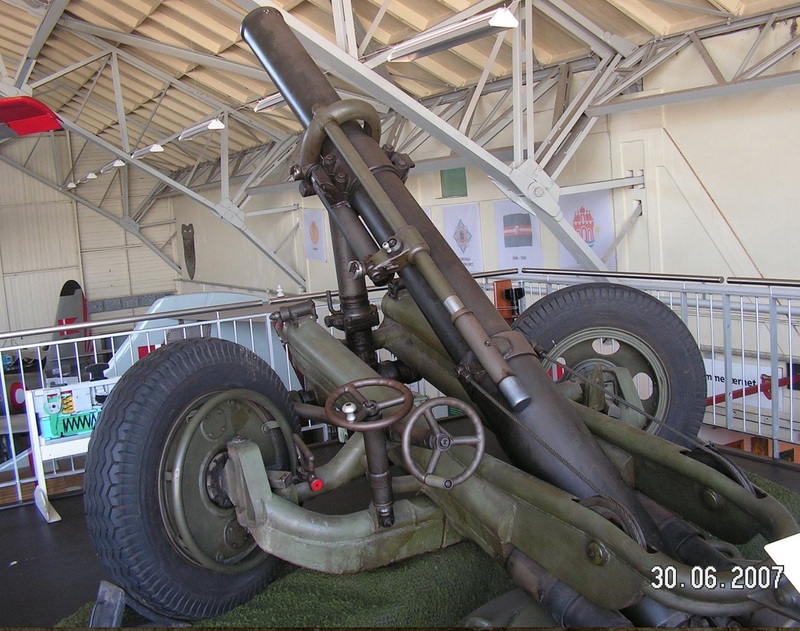 Image 1 – The Second World War-era 300 Krh/42 300 mm mortar from which the later 160 Krh/58C was developed (image credit: Wikimedia Commons). This prototype projectile , however, encountered several difficulties and obstacles during the testing process. Chief among these obstacles was the fact that Finland was bound to the 1947 Paris Peace Agreement with the Soviet Union, which placed broad restrictions on Finnish manufacturing and import/export capabilities. This treaty, which was monitored by a multinational commission, meant that the 160 mm mortar project was forced to operate under a veil of secrecy. With only limited aerodynamic modeling technology to guide the testing of this long-range mortar system, the development of the system stalled due to a variety of issues: the sabot not detaching at the right moment; indecision on an optimal fragmentation-to-explosive weight ratio; inability to assess the full impact of the munition’s payload; poor fragmentation performance; and complicated fuzing. Image 2 – The 160 Krh/58C in its firing position (L) and a developmental stage of the extended-range 160 mm mortar projectile (image credit: Makkonen et al.). Though the system was subject to some testing by the FDF up until 1957 and was well-received for its accuracy at range, it was ultimately deemed inadequate for engaging fortified targets, largely due to the projectile’s slender, spear-like design. Following these trials, the development of the system stalled as the FDF required significant product changes without providing funding. As such, Tampella withdrew the prototype so that it could be developed abroad – a controversial move given the FDF’s request for absolute secrecy surrounding the development of this weapon system. With substantial industrial and human resources already invested in this project that the FDF was no longer funding, Tampella found a potential avenue for further development in Israel. As the nascent Jewish state was eager to develop its own military and arms-manufacturing capabilities, Tampella had previously established a joint company agreement with Solel Boneh Ltd, a prominent Israeli civil engineering firm, in the spring of 1950. Together they had opened a significant weapon and ammunition factory in Haifa, Israel, and named the enterprise ‘Soltam’ (combining the names Solel and Tampella). Tampella would provide expertise and tooling, whilst Solel Boneh would provide facilities, manpower, and funds. Through Salgad S.A. (properly “Societe Anonyme Luxemburgoise de Gestion Et D’Administration “Salgad””), an off-shore subsidiary company based in Luxembourg, Tampella was able to facilitate the sale and transfer of the heavy machinery needed for mortar production to the new Soltam facility. By recording this machinery as ‘agricultural products,’ Tampella was able to bypass international control regimes. Links between Tampella and Soltam were evident in patent documents of the time. For example, US patents listing the inventor as Hans Otto Donner of Tampere, Finland were assigned to Soltam Ltd. of Haifa, Israel. These patents were filed as early as April 1953, and published in late 1956 and early 1957. Another stakeholder in this transfer was a Danish-based company, acting as a discreet broker, named Wejra Ltd. Wejra was in fact jointly established by Tampella and Solel Boneh to enable sales to countries interested in their products, whilst avoiding an overt association with Finland or Israel. The Danish-based company’s products were, at least on paper, Danish. Wejra’s first client was Pakistan. Image 3 – Photographs taken during a firing demonstration conducted by Wejra Ltd. at the Oksbøl Military Training Area in Denmark. According to an original caption, the demonstration was “attended by a multinational group”. 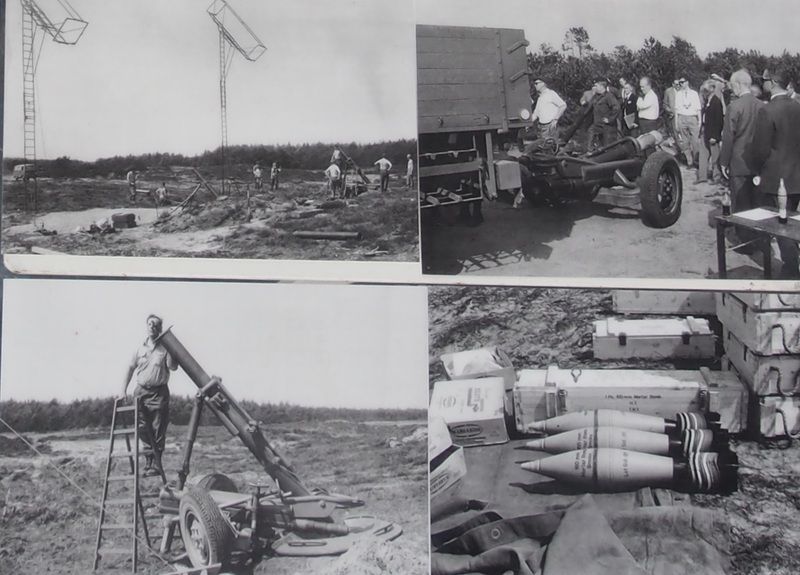 Note the photo at bottom-right, showing the mortar was tested with conventionally-configured 160 mm munitions (image credit: Aalborg Defence and Garrison Museum). Other companies included Deutam G.m.b.H. (‘Deutsche Tampella’), in Germany; Portam in Portugal, and Tamares Ltd., in the UK. Finnish-Israeli collaboration in Tampella continued until 1974. Israeli funding made it possible for Tampella to develop, test, and produce several mortar systems, making it a world leader in the development and manufacture of mortar systems and their munitions throughout the 1960s and 70s. The main calibres it produced were 60 mm, 81 mm, 120 mm and 160 mm systems, and associated munitions including HE, white phosphorous, Illumination, and even chemical payloads. Several of Soltam’s products have seen commercial success, most notably the K6 120 mm mortar, a near-copy of the Tampella 120 Krh/62A-H model, which has been adopted by many nations worldwide. In 1990, US forces adopted a later variant of this weapon as the M120. Despite Soltam’s limited success, the venture nevertheless accrued a negative international reputation. Soltam was known for arming both sides of the Nicaraguan Civil War, from which evidence emerged that their mortar systems were used extensively to target civilians. This naturally led to questions about Israel’s and Finland’s involvement in the global proliferation of arms and ammunition, ultimately leading to Tampella’s withdrawal from the joint Soltam venture. 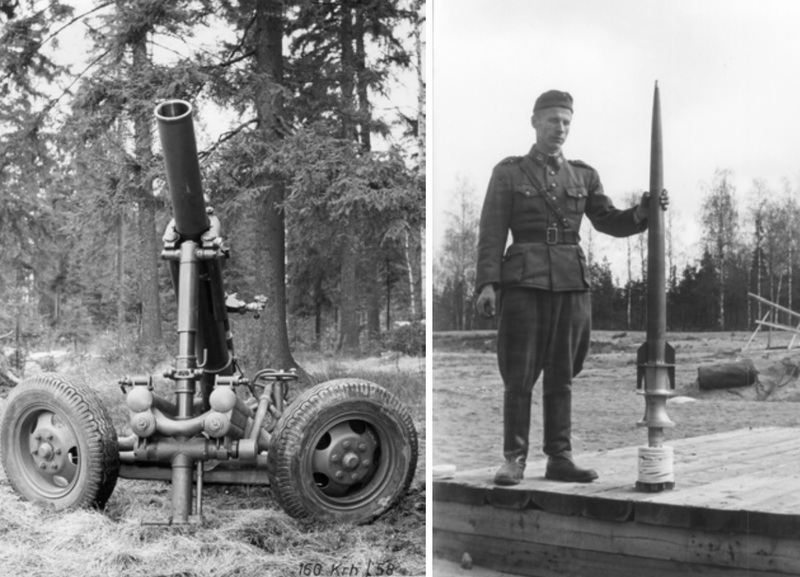 Tampella’s most widely-manufactured 160 mm mortar system was known as the 160 Krh/58C, loosely based on the aforementioned 1942 300 mm mortar system. A version of the 58C, the Soltam M66, was adopted by the Israel Defense Forces. This included a self-propelled variant, known as the ‘Makmat 160 mm’, in which the mortar was fitted to an M4 Sherman tank chassis. Beyond the IDF, however, the 58C never saw significant commercial success. In the late 1990s, Lockheed Martin and Mauser would attempt to install a modernized version of the 58C on various tanks and other armoured fighting vehicles, but their bids were unsuccessful. The ‘spear’ or ‘arrow’ projectile is known in US EOD publications as the Model 1/53, and was specifically designed to increase the range of mortar systems without adding additional weight to the gun. Conventional mortars are simple, lightweight guns, firing projectiles at relatively low velocities and transmitting the recoil impulse directly to the ground. This ensures they are relatively lightweight and portable, however it does limit their employment ranges. The simplest solution to achieving longer ranges is to use more propellant for a given projectile, however this necessitates stronger barrels (‘tubes’) and thus substantially increases weight. Image 4 – A 160Krh/58C 160 mm mortar at the Aalborg Defence and Garrison Museum, Denmark. This weapon was used during a firing demonstration by Wejra Ltd. in Denmark in 1970 (image credit: Wikimedia Commons). Image 5 – The Model 1/53 high explosive fin-stabilised discarding sabot (HEFSDS) extended-range 160 mm mortar projectile (source: via Facebook, original source unknown). The projectile body is manufactured from steel, the fuze nose element is brass with an aluminum firing pin cap, and the tail boom and the fins of the sabot are made from aluminum. The body is painted black, and features white painted markings. The propellant increments are covered with cloth. 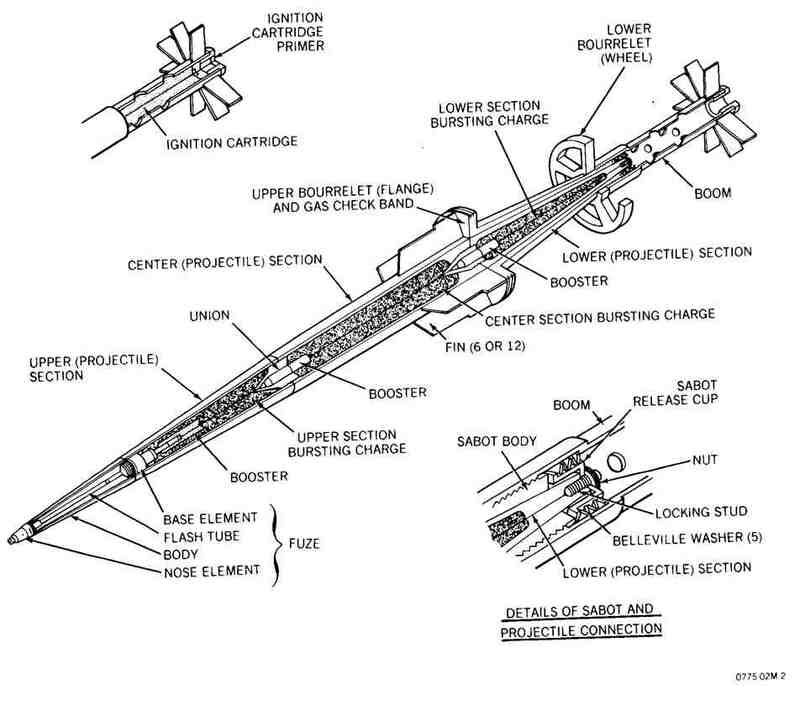 Image 6 – Diagram from an EOD publication (available online) showing the Model 1/53 projectile in cross-sectional detail (source: via CORD database). The fuze is situated in the nose of the projectile and is of the setback-armed, impact-fired, point-detonating (PD) type. The projectile is capable of delivering a little over 1.5 kg of high explosive (in this case, TNT) to a target. By way of comparison, conventionally-configured 120 mm mortar projectiles often contain 2.00 to 2.65 kg of high explosives. The Soltam M4 160 mm HE projectile carries 5.0 kg of TNT. Technical specifications from the Aalborg Defence and Garrison Museum. Technical specifications from a US EOD publication, some of which are available at the CORD database. Note: Multiple, conflicting data sources exist for this munition. The designation ‘Model 1/53’, as used in US EOD publications, is used in this article to reflect the name recognised by many practitioners in the field. However, it should be noted that ARES could not confirm this designation in original Finnish sources. Several sources refer to it as the ‘160mm LR’ or ‘160mm Arrow’ projectile. There are also discrepancies in technical data given in different sources. It appears that much of the documentation relating to the design, development, and testing of this projectile was lost during the liquidation of Tampella. Image 5 – The Model 1/53 high explosive fin-stabilised discarding sabot (HEFSDS) extended-range 160 mm mortar projectile and packaging (source: via Facebook, original source unknown). 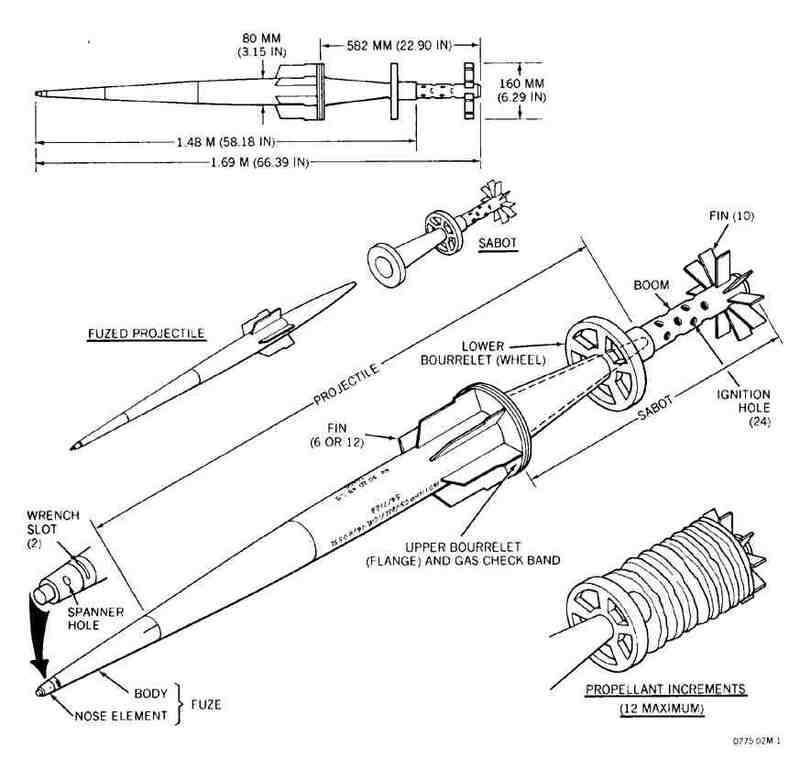 Image 8 – Diagram from an EOD publication (available online) showing the Model 1/53 projectile in detail (source: via CORD database). Makkonen et al. 2004. 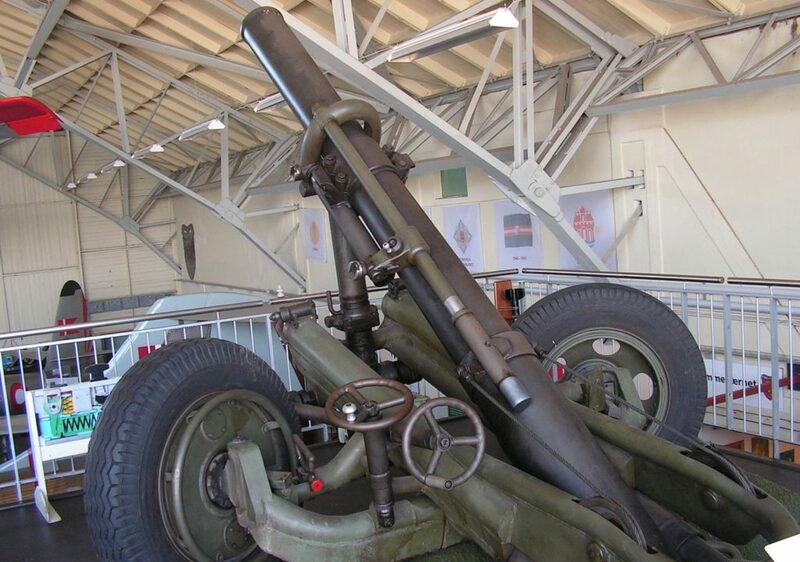 “History Revisited – Ballistics of Tampella 160 and 300 mm Mortar Bombs”. International Symposium on Ballistics (2004). Paulaharju, Jyri, Sinerma, Martti. 1991. “SUOMEN KENTTÄTYKISTÖN HISTORIA”. Osa 3. Etelä-Saimaan kustannus Oy, Lappeenranta. Toivonen, Vesa. 2003. “TAMPELLASTA PATRIAAN. 70 vuotta suomalaista raskasta aseenvalmistusta”. Karisto Oy. Special thanks to Michael Weber, Samuel Paunila, and others.